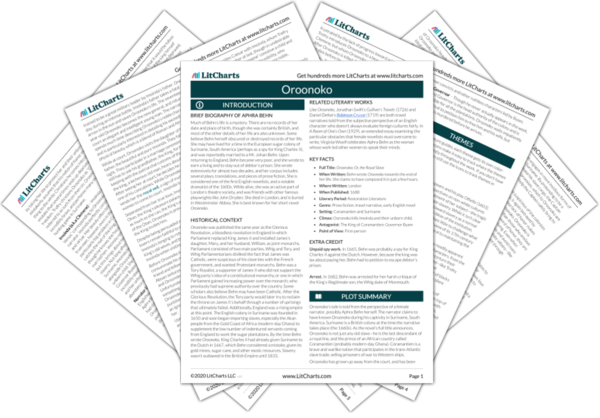 Instant downloads of all 946 LitChart PDFs (including Oroonoko). Welcome to the LitCharts study guide on Aphra Behn's Oroonoko. Created by the original team behind SparkNotes, LitCharts are the world's best literature guides. A concise biography of Aphra Behn plus historical and literary context for Oroonoko. A quick-reference summary: Oroonoko on a single page. In-depth summary and analysis of every chapter of Oroonoko. Visual theme-tracking, too. Explanations, analysis, and visualizations of Oroonoko's themes. Oroonoko's important quotes, sortable by theme, character, or chapter. Description, analysis, and timelines for Oroonoko's characters. Explanations of Oroonoko's symbols, and tracking of where they appear. An interactive data visualization of Oroonoko's plot and themes. Much of Behn’s life is a mystery. There are no records of her date and place of birth, though she was certainly British, and most of the other details of her life are also unknown. Some believe Behn herself obscured or destroyed records of her life. She may have lived for a time in the European sugar colony of Suriname, South America (perhaps as a spy for King Charles II), and was reportedly married to a Mr. Johan Behn. Upon returning to England, Behn became very poor, and she wrote to earn a living and to stay out of debtor’s prison. She wrote extensively for almost two decades, and her corpus includes several plays, translations, and pieces of prose fiction. She is considered one of the first English novelists, and a notable dramatist of the 1600s. While alive, she was an active part of London’s theatre society, and was friends with other famous playwrights like John Dryden. She died in London, and is buried in Westminster Abbey. She is best known for her short novel Oroonoko. Oroonoko was published the same year as the Glorious Revolution, a bloodless revolution in England in which Parliament replaced King James II and installed James’s daughter, Mary, and her husband, William, as joint-monarchs. Parliament consisted of two main parties, Whig and Tory, and Whig Parliamentarians disliked the fact that James was Catholic, were suspicious of his close ties with the French government, and wanted Protestant monarchs. Behn was a Tory Royalist, a supporter of James II who did not support the Whig party’s idea of a constitutional monarchy, or one in which Parliament gained increasing power over the monarch, who previously had supreme authority over the country. Some scholars also believe Behn may have been Catholic. After the Glorious Revolution, the Tory party would later try to reclaim the throne on James II’s behalf through a number of uprisings that ultimately failed. Additionally, England was a rising empire at this point. The English colony in Suriname was founded in 1650 and soon began importing slaves, especially the Akan people from the Gold Coast of Africa (modern-day Ghana) to supplement the low number of indentured servants coming from England to work the sugar plantations. By the time Behn wrote Oroonoko, King Charles II had already given Suriname to the Dutch in 1667, which Behn considered a mistake, given its gold mines, sugar cane, and other exotic resources. Slavery wasn’t outlawed in the British Empire until 1833. Like Oroonoko, Jonathan Swift’s Gulliver’s Travels (1726) and Daniel Defoe’s Robinson Crusoe (1719) are both travel narratives told from the subjective perspective of an English character who doesn’t always evaluate foreign cultures fairly. In A Room of One’s Own (1929), an extended essay examining the particular obstacles that female novelists must overcome to write, Virginia Woolf celebrates Aphra Behn as the woman whose work led other women to speak their minds. When Written: Behn wrote Oroonoko towards the end of her life. She claims to have composed it in just a few hours. Climax: Ooronoko kills Imoinda and their unborn child. Unpaid spy work. In 1665, Behn was probably a spy for King Charles II against the Dutch. However, because the king was lax about paying her, Behn had to petition to escape debtor’s prison. Arrest. In 1682, Behn was arrested for her harsh critique of the King’s illegitimate son, the Whig duke of Monmouth. Beiner, Suzannah. "Oroonoko." LitCharts. LitCharts LLC, 20 Jan 2016. Web. 24 Apr 2019. Beiner, Suzannah. "Oroonoko." LitCharts LLC, January 20, 2016. Retrieved April 24, 2019. https://www.litcharts.com/lit/oroonoko.